The All New, All Daring Delusional Honesty! 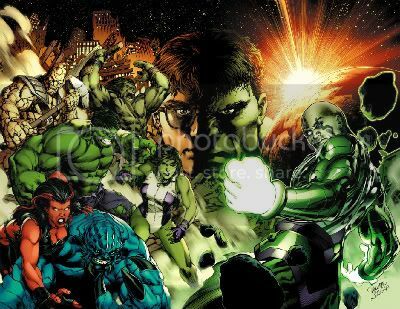 : Folly Of The Hulks: Too Many Hulks, Too Few Puny Humans? Hey Gary - Ratchet here - great article, as always. I had the same fear and an too worried about the upcoming Hulks title. Sure, Pak has delivered in the past, but with all that power on one team who are they going to face down? Very insightful article, and to be honest, I share your concerns with the concept of a Hulk team-book. Ironically, for all the Hulk's talk about "puny humans", it's the human factor that should be the heart and soul of every issue of the series. That's also one reason why I couldn't entirely warm up to PLANET HULK the way other readers could. Add the fact that I found the Warbound an occasionally arrogant and self-righteous lot (especially during the WORLD WAR HULK saga), and you have an A-list title chocked to the brim with an unlikeable cast. On the other hand, the prospect of a Hulk-centric team has some terrific potential for real drama, intimacy, and pathos. All of the characters, with the possible exception of Korg, are really "humans in disguise", complete with all our sordid little human foibles and faults. There's something genuinely sad about how both Betty and Rick had to become monsters themselves to even remain safe around the Hulk (he crippled Rick once, while Betty DIED from cumulative radiation exposure), and I hope Pak dives into that a little. If played right, THE INCREDIBLE HULKS could be a fascinating peek into a dysfunctional pseudo-family of monsters who simultaneously love and abuse one another. Color me worried, but a little excited too. I too share your concerns. But I alot of faith in Greg Pak's ability to pull this off. I am sure that there will be some hiccups along the way but, with no Jeph Loeb around I am sure that the Hulk Brain Trust can assist Greg Pak with any problems that he may come accross. PS I don't know if you saw the message I left on your other blog but, I wanted to say again congratulations on writing such a wonderful article on Jameson's website. I do hope that it will be the first of many! PS Enjoy the rest of your weekend. Frankly, I'm more interested to learn what kind of VILLAINS Pak could possibly use against the Incredible Hulks (plural). The problem with a superhero team as powerful as, say, the Justice League, is that you need a baddie who would have to be RIDICULOUSLY powerful just to pose a sufficient threat to the entire group. The Hulk is a force to be reckoned with by himself, but a whole BATCH of Hulks? You'd need someone on the caliber of Thanos or Loki to even have a chance of intimidating them. An ideal scenario would be to have enemies that possess a PSYCHOLOGICAL in addition to a PHYSICAL menace. Nightmare is a good candidate - we already know he has a personal vendetta against the Hulk, one that he'd happily expand to the rest of his newfound "family" - but bringing back someone like Brian Banner, the source of all Bruce's neurosis and the evil "patriach" of the Hulk clan (in a sense), would be flat-out badass, IMO. Gary,I was partially inspired by your comments to give a brief review about what was wrong with Bruce Jones's run on the Hulk. I was wondering if you read it. So far nobody has commented on it. Any thoughts? Zeno--hey, I haven't seen your review about Bruce Jones' run. Link me up and I'll gladly comment! Gary,it is on Ratchet's site. It is in the interview comments. There was a interview with Ratchet last week. I just left the comment two days ago though. It should be the last comment for that post. You probably know the interview I mean. Just posted a brief reply. You'd probably enjoy the CBR board discussions now--I'm in a thread all about explaining World War Hulks, and we're getting into quite the interesting pieces of Ross' history, connecting dots that up to now were just sort of....out there. Gary,would you post a link to this discussion? It sounds interesting. Hulk? It's too soon to tell I guess. "Will they have a Hulk Lair and a Hulk Winnebago? In what way will they be 'a team of Hulks unleashed upon the Marvel Universe'? "Centering the book on Hiro Kala as the villain is quite a gamble as well as so many readers, even Hulk readers, may not know who he is. "I guess we'll have to wait and see." You know, I have to admit the idea of a "Hulk Lair" might be awesome, if done right. Anybody remember that cave in New Mexico, the one where Bruce and Rick first tried to imprison the Hulk waaaaay back in INCREDIBLE HULK #2? A team of Hulks would easily have the strength and resources to renovate and expand it into something really cool. The cave in New Mexico has been upgraded and has recently served as Banner and the Red Hulk's base of operations circa "Fall of the Hulks." Interesting plan, though.